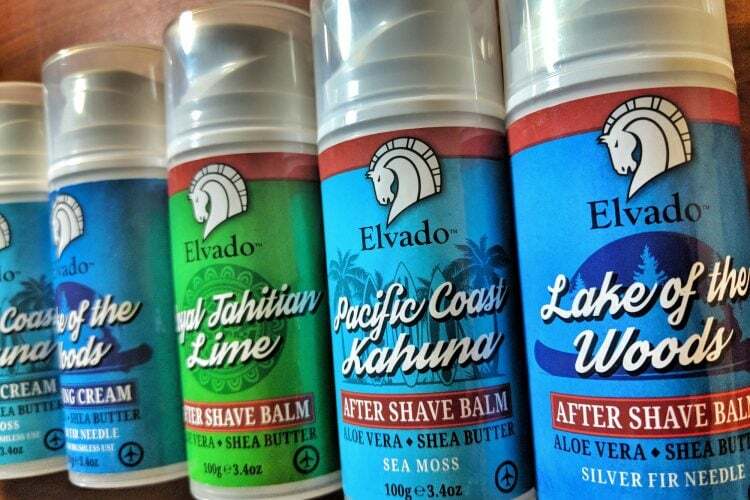 To make a long story short, Elvado’s line of shaving creams and aftershaves made me an immediate believer. I’ll wager you want to hear some details, though, so let’s jump into it. The first thing that caught my eye about Elvado was the amount of variety. Some shaving creams are content sticking to a single, tried-and-true blend, making it their proverbial bread and butter. Elvado, on the other hand, seems comfortable with experimentation. They have four aptly-named concoctions. That level of variety extends further than the shaving cream blends. In addition to standard jars, they also have applicator bottles that you can use sans shaving brush — a definite plus for those times you just don’t feel like having bristles in your face. In examining the containers for Elvado’s creams, I got a positive impression right off the bat. The branding is professional enough to convey quality, but not so cookie-cutter and corporate that it becomes forgettable. Turning one of the containers over, I looked over the ingredients, learning that their boasts of being “natural, pure, and simple,” weren’t idle bluster. Coconut, avocado, shea butter, essential oils — these were just a few of the elements that stood out. I was also able to glean that several of those ingredients were organic, and their natural plant based preservative is Eco-cert approved. That means they’ve voluntarily submitted to a certification/verification process for their ingredients and placed a premium on appearing authentic. Knowing that gave me confidence about Elvado’s claims of being committed to providing natural alternatives to (what they describe as) “the bland, toxin-laden products that pervade today’s marketplace.” Satisfied thus far, I decided it was time to put the shaving cream through its paces. Upon opening one of the jars, I was treated to a pleasant surprise. I realized the tropical theme names weren’t just a clever branding choice — they were dead-on descriptions of each cream’s fragrance. The aromas are emphatic, but not to the point of being overwhelming, and each smells distinct enough to be memorable. I found the Royal Tahitian Lime to be the most appealing (the hint of citrus is a perfect touch), so I used that for my first test shave. The cream was successful in creating the “creamy and slippery cushion of lather” Elvado promises. I use a single-blade razor, and, in combination with Elvado’s cream it was gliding across my skin with ease as I shaved. All the while, I felt a gentle tingle that was simultaneously cool and pleasant. After finishing my shave and applying some of Elvado’s aftershave balm (again, the Royal Tahitian Lime) my face felt refreshed. No irritation, no itching, no burning — a welcome change from the run-of-the mill shaving experience. My experiences with Elvado’s other creams in the days that followed played out similarly, with the only difference being how my face smelled afterwards. None were repulsive and each was unique, but in the end I’d still crown the Royal Tahitian Lime as the king of Elvado’s current roster. My escapades with Elvado were wholly positive. Their products look, smell, and feel great. They promised an outstanding shave and their cream lived up to their marketing hype. Personally, I’m a sucker for anything that leaves my face smooth and fragrant, which it seems is Elvado’s strong suit. To top it off, Elvado’s stated commitment to selling bio-friendly products made with natural ingredients and zero animal testing is reassuring. I’m a consumer who, at the very least, tries to stay conscious about what practices my dollars are endorsing. Knowing Elvado takes that sort of thing to heart earns them some extra credit in my book. The shave creams are also packaged in airless pumps and are crafted for both brush and brushless use, depending on your preference. The 100g size is great for travel and TSA Compliant (for those who like to carry on their dopp kits for flights). Final Verdict: Should you buy Elvado's shaving products? I’ll be incorporating Elvado’s shaving creams and aftershaves into my regular lineup of grooming products. Though I normally prefer a more complete shaving experience, brush and all, providing the option of executing a quicker shave job without a brush was a smart move on Elvado’s part (and something the “no brush” crowd will appreciate). If you’re a fan of getting a close shave and prefer products that are environmentally-friendly, I’ve a good feeling you’ll enjoy all of Elvado’s offerings too.